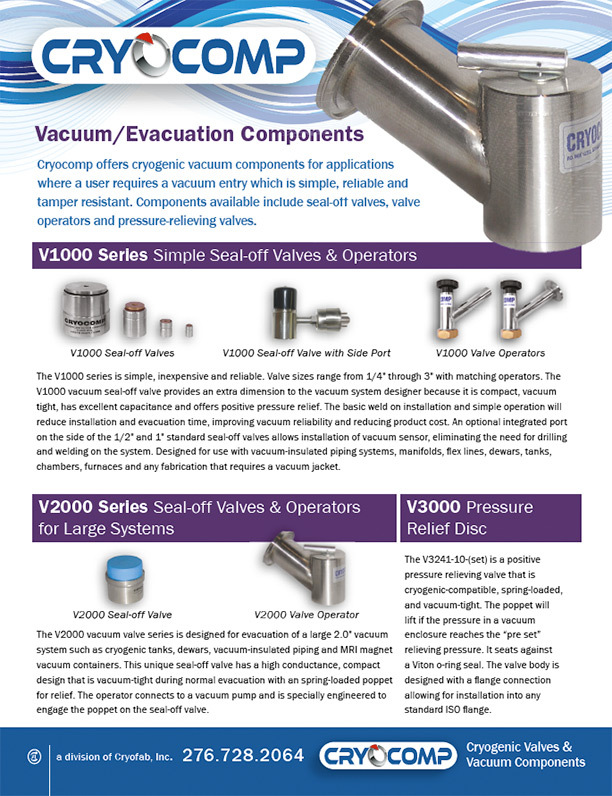 It’s easy to specify Cryocomp’s simple, reliable and tamper-resistant cryogenic vacuum components (also called evacuation components) for cryogenic applications that require a vacuum entry. You can select seal-off valves, operators, or pressure relieving valves. Our components are engineered in a range of sizes from 1/4" to 3" to fit vacuum-insulated piping systems, manifolds, flex lines, dewars, tanks, chambers, furnaces, MRI magnet vacuum containers, and any fabrication that requires a vacuum jacket. Select the features you require for your cryogenic vacuum components and build the part number using the option codes provided below. For example: V1085-1 = Series 1000, 1.0", Stainless, Vacuum Seal-off Valve.